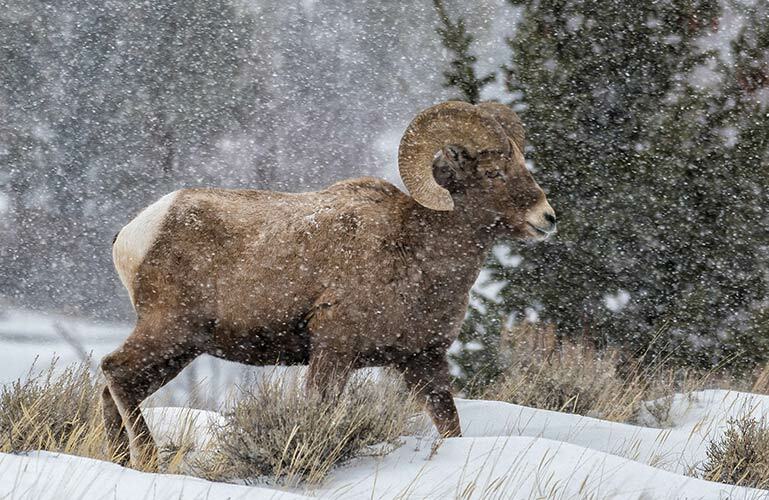 The Rocky Mountain Bighorn Sheep is the largest wild sheep inhabiting North America. A large ram (a male sheep) may weigh over 300 pounds and stand over 42 inches tall at the shoulder. They are generally a dark brown to gray/brown color with a white rump patch, muzzle and back of legs. Their coats may appear considerably lighter in spring before the winter coat is shed revealing the darker summer coat beneath. Rams have horns that are massive and tightly curled close to the face. A ewe (a female sheep) will have smaller shorter horns that curve only slightly. Ewes typically weigh 125-150 pounds. 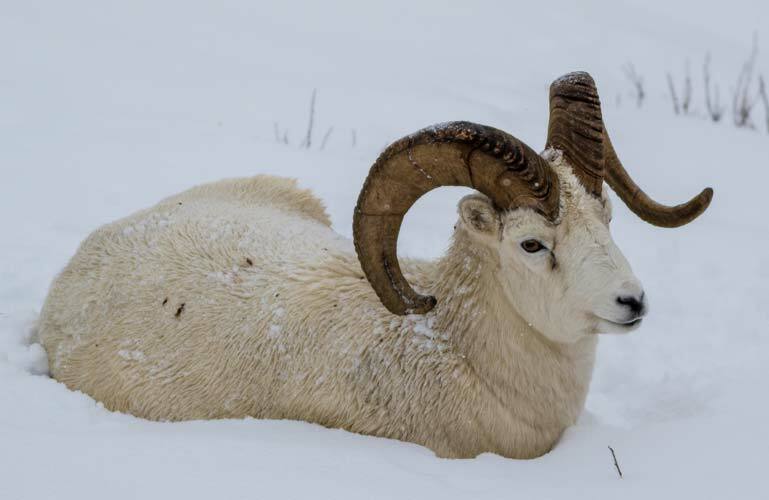 Rocky Mountain Bighorns are found in British Columbia and Alberta, Canada and in the western United States south to New Mexico. 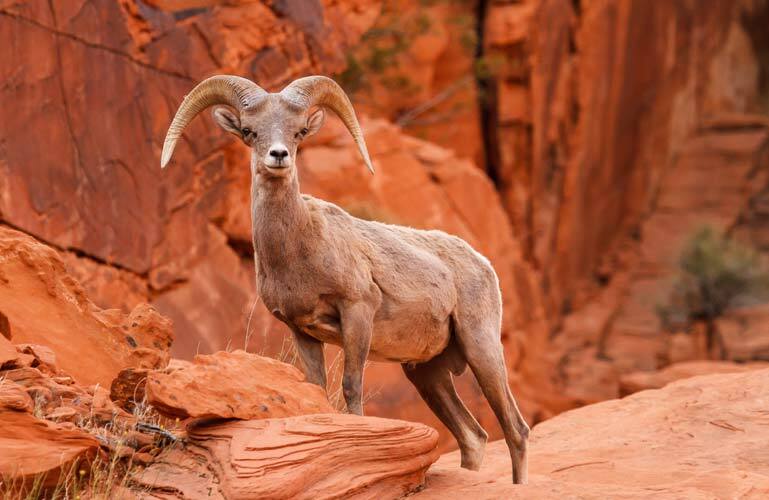 Desert Bighorn Sheep are generally smaller and lighter colored than their cousins, the Rocky Mountain Bighorn Sheep. 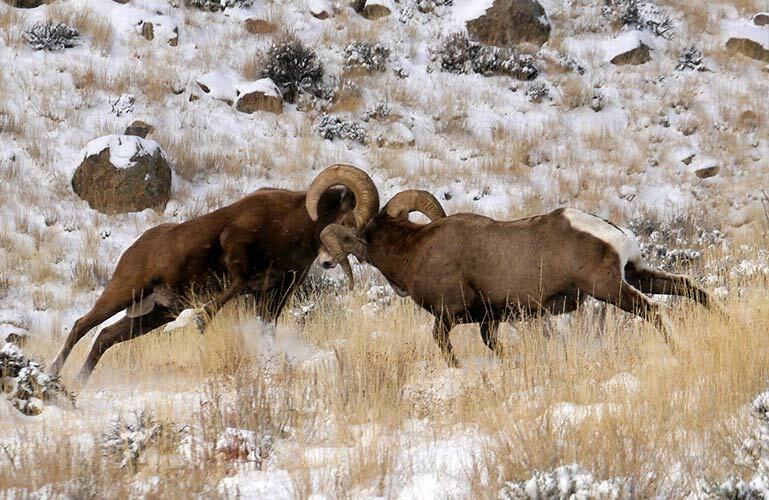 A large ram is usually not over 220 pounds. They stand 38-42 inches tall at the shoulder. 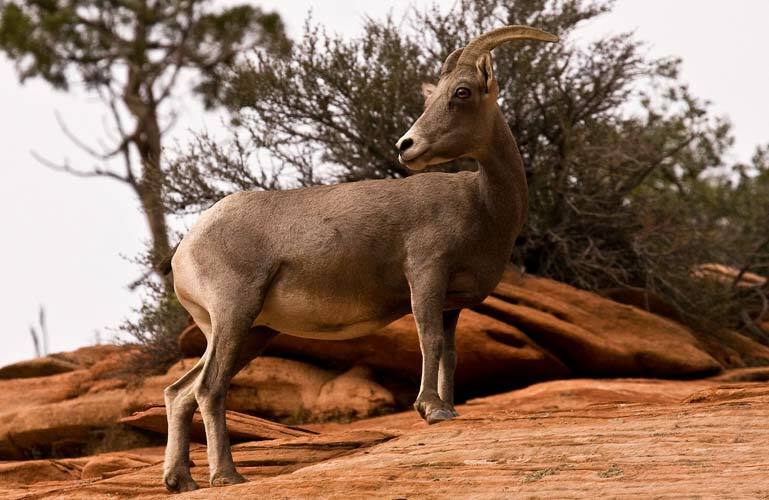 Desert Bighorns are found in the southwestern United States, including Utah, Nevada, New Mexico, Arizona and southern California. A significant population is also found in northern Mexico. The horns of Desert Bighorns are typically longer and not as massive as those of Rocky Mountain Bighorns. They are usually curled close to the face, but may flare widely outward, showing wide variation in horn structure between individuals. 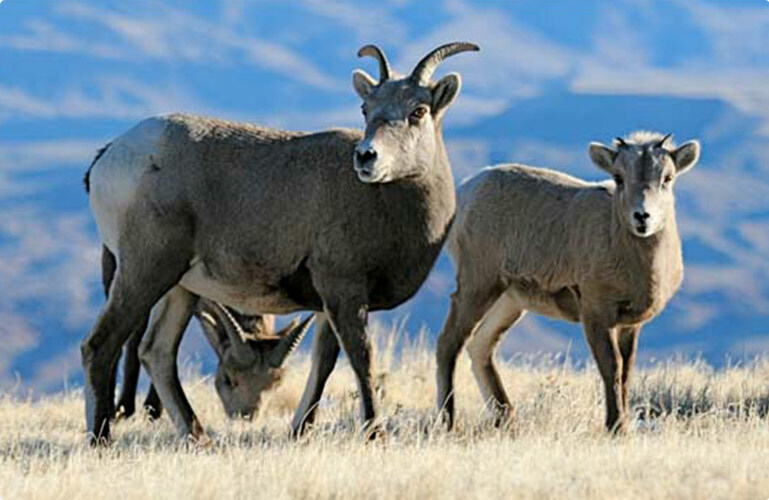 Desert Bighorns also have slightly longer ears and tails than Rocky Mountain Bighorns. 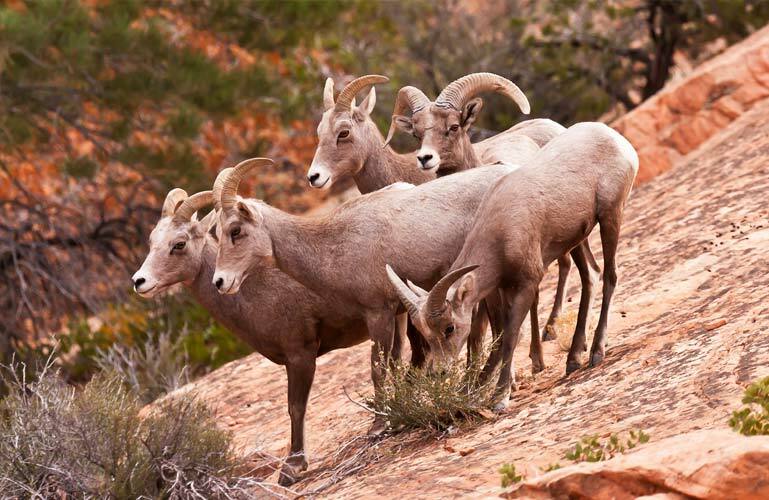 Desert Bighorn ewes also typically have longer horns than other North American wild sheep females. 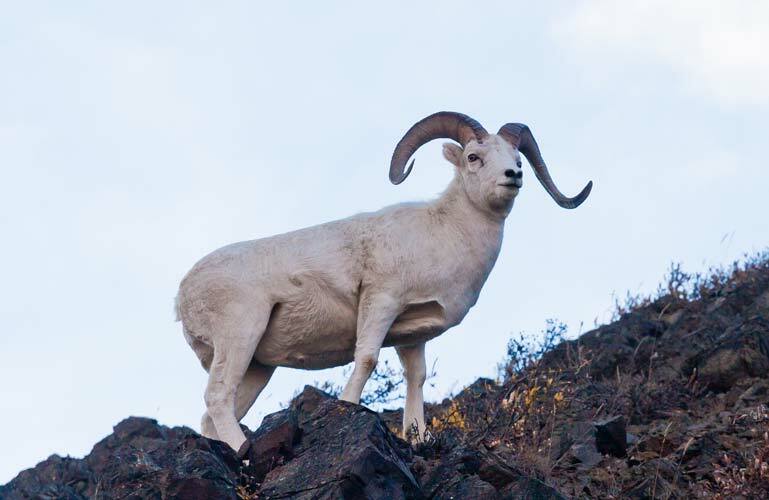 The most striking feature of the Dall Sheep is their nearly all white color. The Dall Sheep is actually a “thinhorn” sheep. Their horns are longer, thinner and yellowish in color when compared to horns of Bighorn Sheep. Their horns also tend to flare outward, away from the face. Ewes horns are usually not over 12 inches long. Dall rams can weigh 225 pounds and stand 40 inches tall at the shoulder. Dall Sheep primarily inhabit Alaska and the Yukon Territory, but are also found in British Columbia and the Northwest Territories. The Stone Sheep is a darker subspecies of the Dall Sheep, which also is a thinhorn sheep. Stone Sheep rams can weigh up to 250 pounds and stand 40 inches tall at the shoulder. Ewes typically weigh 30-40% less than the rams and stand 36 inches tall at the shoulder. There are many color phases of Stone Sheep, from an almost black charcoal to light gray/brown and “salt & pepper”. They typically have lighter faces, a white rump patch and white on the backs of the legs. Their horns are longer, thinner and more yellow than those of bighorns and tend to flare outward, away from the face like those of Dall Sheep. 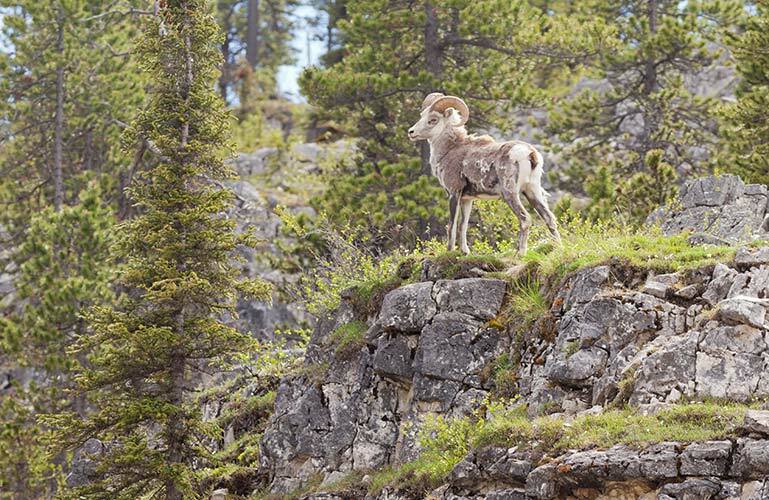 Stone Sheep are primarily found in southern Yukon Territory and northern British Columbia. 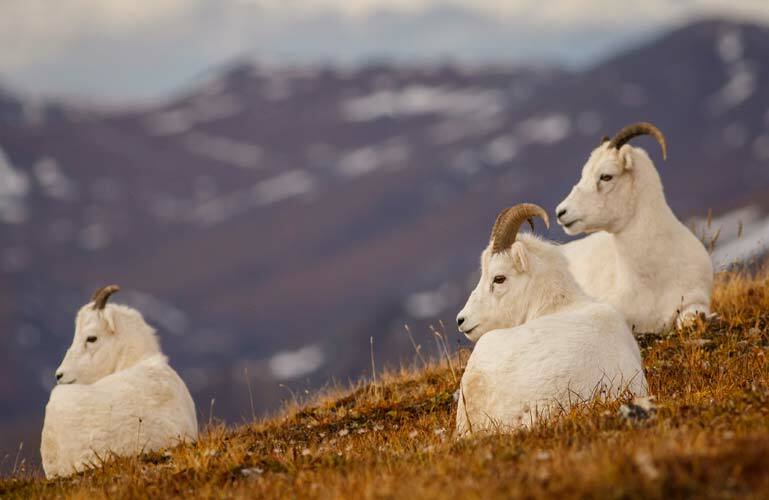 In areas where the ranges of Stone Sheep and Dall Sheep may overlap, an intermediate color phase may be found, which is referred to as a “Fannin’s Sheep.” Technically, an otherwise white sheep with black hairs anywhere except on the tail, is considered a Stone or Fannin’s Sheep. The Mountain Goat, Oreamnos americanus, often confused with white wild sheep. 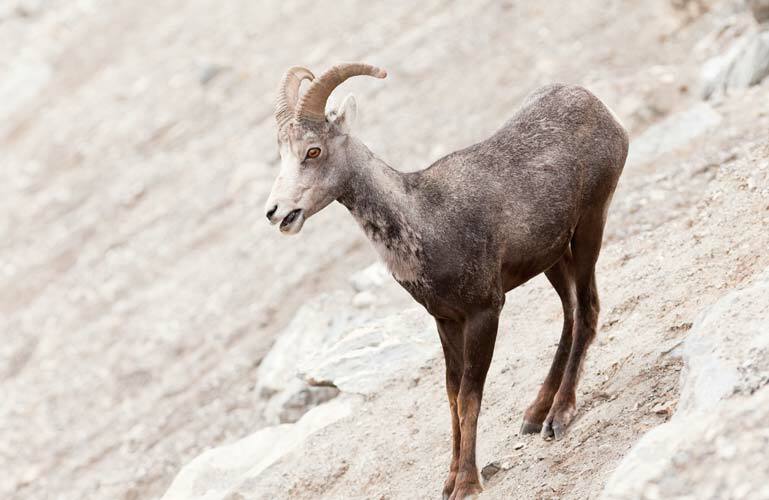 Wild sheep and mountain goats (Oreamnos americanus) are close cousins, both belonging to the Family Bovidae, but they are distinctly different species. To the inexperienced eye, female sheep, especially Dall sheep, may be confused with mountain goats. The most obvious differences between wild sheep and goats are hair color, horn color and structure, and hair length. Mountain goats are creamy-white or yellowish-white, never tan, brown or gray. Both sexes of goats have black horns. When compared to the horns of sheep, their horns are thinner, sharper and swept backward, but not curling. Goats horns average 10″ in length. Mountain goats also have longer hair than wild sheep. Especially in winter, the longer hair may form a beard under the chin, and the abruptly ending longer hair on the front legs gives them the appearance of wearing “pantaloons”. Goats also have longer, thinner and more sharply pointed ears, often described as pixie-like. Billies (male goats) can reach over 250 pounds and a large nanny (female goat) may weigh 200 pounds. 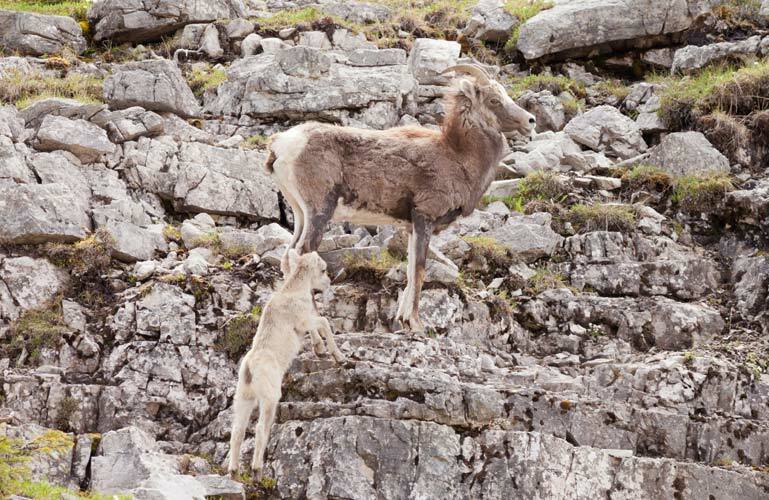 The ranges of mountain goats and wild sheep may overlap, although goats will usually choose terrain that is even steeper and more precipitous than the favored terrain of sheep. If feeding and bedding areas are challenged, goats are usually more aggressive animals than sheep and will push sheep out of the preferred areas. Mountain goats are found in Canada, Alaska, Washington, Idaho, Oregon and Montana. Small populations found in other states, including Wyoming, exist because of transplantation. 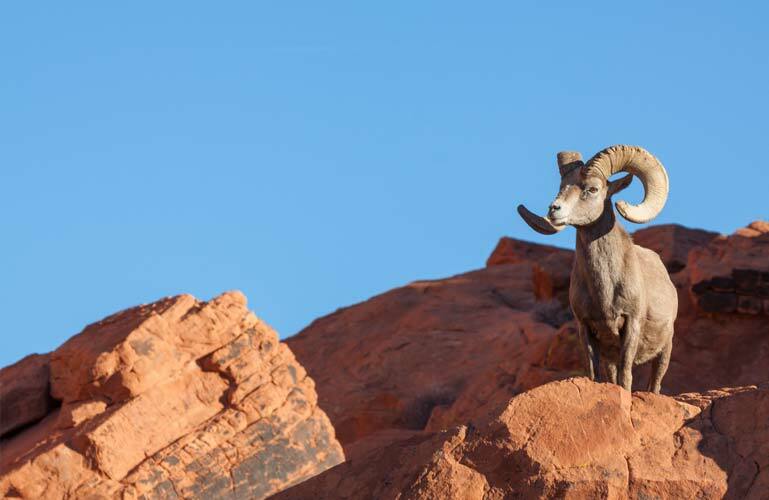 Bighorn Sheep throughout North America, including our local Whiskey Mountain herd face habitat, disease and other challenges. 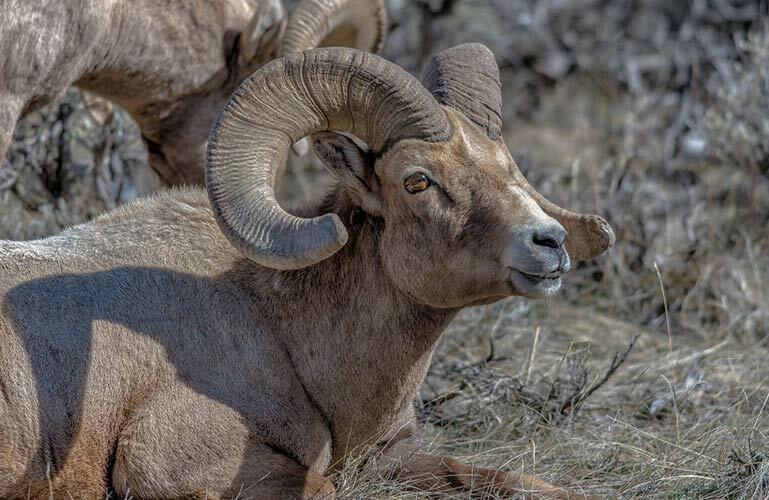 We work with our partners to help educate people about these factors facing bighorns and what conservation efforts are underway to help conserve wild sheep populations. 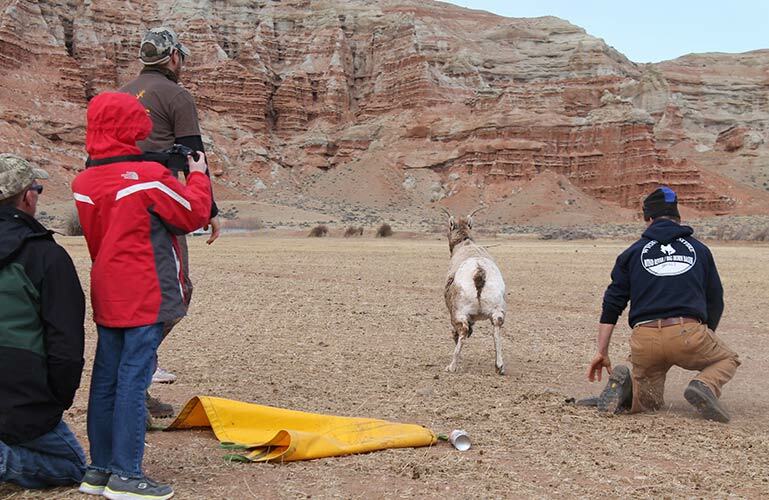 From disease research and population monitoring to habitat enhancement projects, wild sheep relocation and efforts to reduce wild and domestic sheep interactions, our partners work to ensure that wild sheep populations are better understood, managed and conserved. 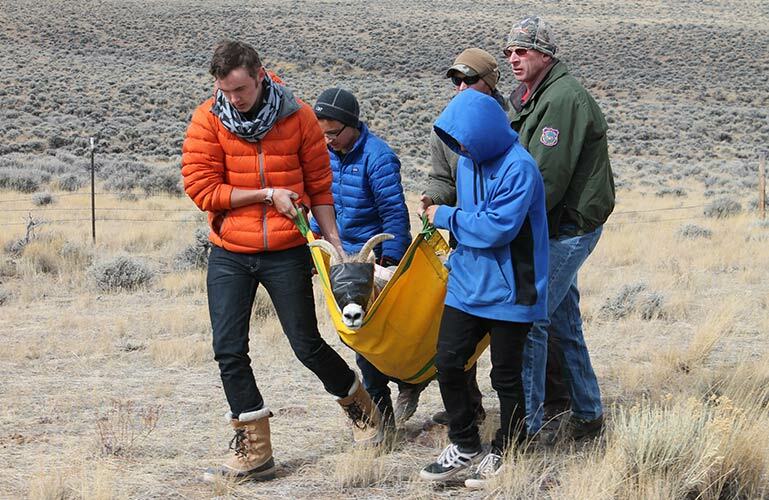 Our work in education both at the Center, in classrooms and in the field helps connect people to these opportunities and learn about what can be done to help wild sheep populations now and in the future. 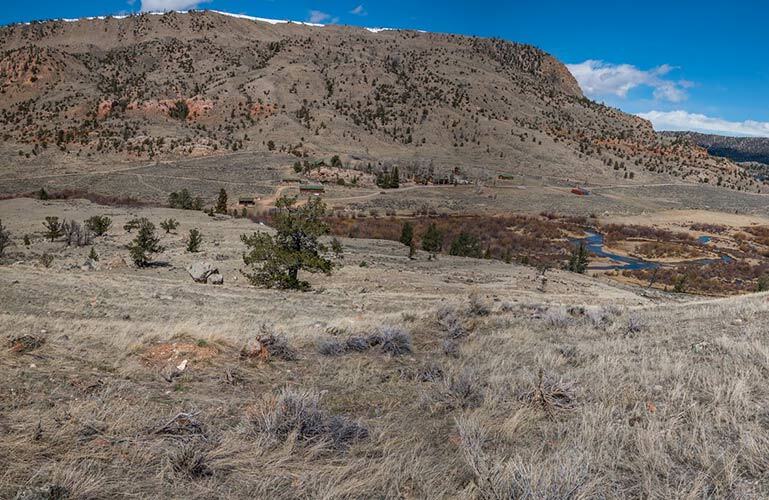 Visit our partners page for links to additional agencies and organizations working to help conserve wild sheep in Wyoming and North America.